Howe of Fife are looking forward to a break this weekend after a heavy 60-14 defeat at Falkirk last Saturday. 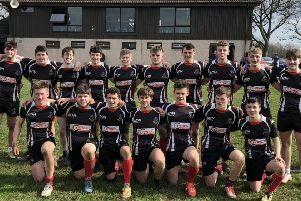 The first XV are next in action against Whitecraigs at home on December 1. Head coach Chris Martin hopes to have more players back for that match, including key man Sean Murray who had scored 12 tries in eight matches before suffering a hamstring tear against Stewart’s Melville. He said: “We had 17 players fit who travelled last Saturday and they have been playing every week so they are tired. We have seven/ eight key players out. We have just been getting by the last few weeks and I really have to commend the effort the guys are putting in. They are really up against it. “We are lucky we have got this weekend off and a few guys coming back for the Whitecraigs game. With the personnel we have got on our day we can challenge any team in the league. It’s just been consistency we are lacking. Reflecting on the big loss at Falkirk, he added: “If you look at the scoreboard it would certainly imply it was a heavy defeat, but we made a lot of improvements in certain areas from previous weeks.